Wood was born Ellen Meiksins one year after her parents, Latvian Jews active in the Bund, arrived in New York from Europe as political refugees. She was raised in the United States and Europe. Wood received a B.A. in Slavic languages from the University of California, Berkeley in 1962 and subsequently entered the graduate program in political science at the University of California, Los Angeles, from which she received the Ph.D. in 1970. 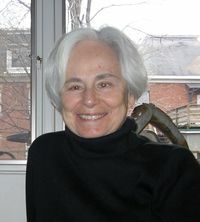 From 1967 to 1996, she taught political science at Glendon College, York University in Toronto, Canada. She has written many books and articles, some conjointly with her husband, Neal Wood (1922–2003). Her book The Retreat from Class received the Isaac Deutscher Memorial Prize in 1988. Her work has been translated into many languages, including Spanish, Portuguese, Italian, French, German, Greek, Turkish, Chinese, Korean, and Japanese. Wood served on the editorial committee of the British journal New Left Review between 1984 and 1993. From 1997 to 2000, Wood was an editor, along with Harry Magdoff and Paul Sweezy, of Monthly Review, the independent socialist magazine. In 1996, she was inducted into the Royal Society of Canada, a marker of distinguished scholarship. She now resides in England.